Newly separated from her husband and living with her two young daughters in an apartment in Santa Monica, CA, Alexandra DeFurio, a then 36-year-old freelance photographer, found herself in a state of despair. Her daughters Sophia and Bella, then four and eight, were spending the night with their father and Alexandra was going to be alone in her apartment for the first time. Less than a week earlier, she’d moved into a group of five bungalows enclosed by a white picket fence, and though she liked the sweet, two-bedroom apartment she’d found with hardwood floors, a tree in the yard for climbing, and a good school nearby, she felt overwhelmed by her new reality. Michelle Fiordaliso, 33 at the time, knew something about raising a child alone. She and her son’s father had split when Joe was two months old, and in the five years that followed, she’d built a community of friends, colleagues, relatives and teachers to go to for advice, babysitting, and the occasional shoulder to cry on. What she didn’t have was a partner to turn to for daily emotional support, but from the moment the two moms met, all that changed. In the mornings, they would meet in their shared yard for coffee or tea, wearing their vintage slips. Unable to leave their kids to go to the gym, they did P90X in that same backyard. If Alexandra came home exhausted after a long day of shooting, Michelle had dinner waiting for her. When Alexandra realized that Michelle and Joe had few photographs together, she started exhaustively documenting their lives. When one had a strength the other didn’t possess, they would bring that skill to the relationship. Alexandra had a natural joy and enthusiasm for life and a special softness with children. Michelle, the more practical of the two, had excellent business skills but could be too serious. So Alexandra taught Michelle how to lighten up, reminding her to smile and became doctor-in-residence to Joe, nursing his wounds with tenderness. Michelle, a published writer, helped Alexandra’s daughter, Sophia, by mentoring her while she wrote a play—something she had always wanted to do — and encouraged Alexandra to maximize her business as a professional photographer. But the most important role they took on was that of co-parents, discussing everything from the mundane — which after-school activities to join, how to get their kids to do their homework — to bigger issues like discipline and supporting their kids through problems with friends. They adopted each other’s traditions: At Halloween, Alexandra implemented “The Switch Witch,” where the kids would exchange their candy for a gift. (“That was so there wasn’t all this candy lying around, making the moms fat,” Michelle jokes.) Birthdays were celebrated together, with everyone on the “kibbutz,” as they referred to their communal home, going around the table and sharing what they appreciated about the birthday boy or girl. The moms became so interchangeably essential that Alexandra would come home to serve dinner to her kids only to find Bella eating a plate of food she’d gotten at Michelle’s. And Michelle recalls one Mother’s Day where Joe came home from school with a gift he’d made — and presented it to Alexandra. The women were there for each other in hard times, too: “Whenever I was feeling pushed to my limit with the kids I could call Michelle and say, ‘Can you come over? I’m about to lose it,’” Alexandra says. “And if she was having a hard time, she would call me to take over. We had relief–which helped us to be better parents.” Michelle recalls the time Alexandra’s car was broadsided near their home; she arrived on the scene as paramedics were cutting Alexandra out of her vehicle with the Jaws of Life. Michelle sprang into action, collecting Sophia from her tutoring lesson and reassuring her that her mother was going to be OK. Only when Michelle returned home later that night did she allow herself to break down, realizing how much she depended on her friend and how tenuous life can be. A few years ago, Alexandra met Peter, a widower with three children, and eventually, they got engaged. Though Peter had a beautiful home with space for her daughters to have their own bedrooms — something they’d wanted for years — Alexandra waited two years to move in. “So many times I thought about moving, but I couldn’t do it; the kids needed each other too much,” Alexandra says. “They would say, ‘We can’t leave Joe, he’s our brother.’” When that day finally arrived, Alexandra had a huge yard sale. Dismantling her daughters’ bunk beds, she came across some graffiti scrawled across a slat of wood. It must have been written during one of the many times the kids had hidden under the bed, giggling. 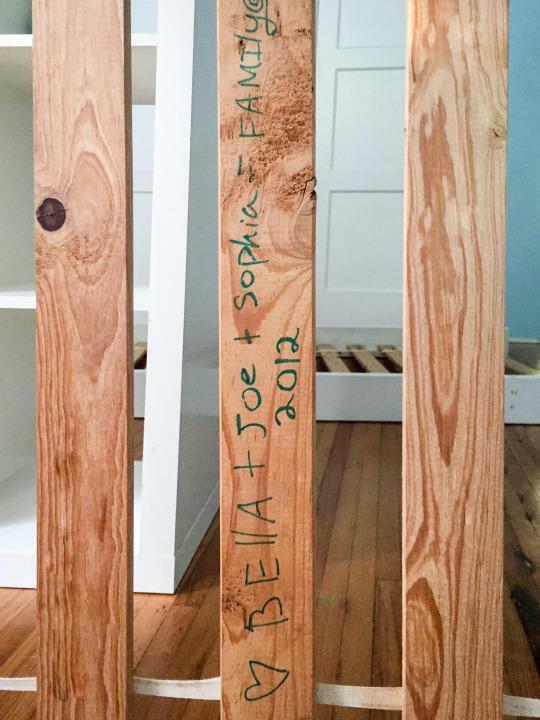 “Bella + Joe + Sophia = Family,” it read. She cried not because she was leaving, or because that part of her life was over — but because it was true. When Alexandra and Michelle first moved in, their kids were four, five and eight; now they’re 14, 15 and 18. “Just like the Sharpie the kids used to write on that plank of wood, the ways in which we’re a family are indelible,” Michelle says.